Whether you’re there for your team, for the love of football, for the love of halftime glitz and funny commercials, or for the wings and beer —Super Bowl Sunday is a day for all kinds. According to some pretty hefty stats from last year, American’s take their Super Bowl gorging habits to the extreme. For instance, Americans purportedly drink 325.5 gallons of beer, eat 4 million pizzas, and consume about 1.23 billion chicken wings on Super Bowl Sunday. No doubt this “national holiday” is an indulgent one, but if you are going to partake, you might as well do it right and make everything as delicious as possible. For that, The Daily Meal has gathered a list of the essential Super Bowl game day party foods and amassed a number of recipes to help to make them as tasty as possible. So whether you’re hosting (i.e. you have the biggest TV) or you’ve been assigned a dish to contribute to the buffet-style spread, check out this list of 20 awesome recipes that are perfect for sharing on Super Bowl Sunday. For the Awesome Burger recipe, click here. Is it even game day without a delicious burger? Burgers will always make people feel like they are at a classic tailgate, even if they’re actually just sitting on the couch instead of in a cold and hectic parking lot. For the Simple Brownies Recipe, click here. Sinfully sweet and chocolatey, brownies are not only delicious but they are great for sharing. Try making this Slow-Cooker Brownie recipe for ultra-gooey brownies or check out all of our best brownie recipes here. For the Mustardy Deviled Eggs recipe, click here. Once you’ve nailed how to make a perfect hard-boiled egg, deviled eggs become an easy and versatile appetizer to make anytime. Delicious and hearty dip always makes for the perfect party dish and this recipe for Buffalo chicken dip is creamy, delicious, a little spicy, and extremely flavorful. If you are looking for something lighter and a touch healthier, look no further than this Chickpea and White Bean Hummus recipe. For more dip recipes, click here. For the Enchiladas Suizas recipe, click here. A steaming hot casserole dish of cheesy enchiladas is a great way to feed your guests and spend all of the game time where you belong: right in front of the TV. For the Spicy Chicken Chili recipe, click here. Quick, easy, and delicious, chili is perfect for a stress-free game-day meal — especially when it’s made ahead of time in a slow-cooker. Check out our best chili recipes here. For the Roasted Garlic Guacamole recipe, click here. Guacamole is just one of those party recipes that is required to make an appearance at every shindig. Check out “Our 50 — Yes, 50 — Best Guacamole Recipes” to find your favorite. For the 'No-Name' Hot Dog recipe, click here. Hot dogs and tailgating were made for each other. Plus, they are simple to make and everyone —young and old alike — loves them. These jalapeño poppers are stuffed with cream cheese and Monterey Jack, rolled in panko breadcrumbs, and then fried until golden. For game day, you can’t just have regular old nachos. You need ultimate nachos, the kind that’s super-loaded with all of the tastiest fixings possible. For the Ultimate Ground Beef Nachos recipe, click here. A bite sized, juicy mini-dog wrapped in dough — how can you go wrong? Be sure to make extra, though; these will go fast. For the Perfect Pigs in a Blanket recipe, click here. For the Easy Barbecue Chicken Pizza recipe, click here. Sure you could order a few pizzas for delivery, but making your own pizza means much more flavor, more options, and fun for everyone. For the Popcorn With Sriracha Butter and Parmesan recipe, click here. When tensions are high and the score is dangerously close, most people reach for something to munch on for distraction. Popcorn is the perfect food for this. Whether you choose to toss your freshly popped kernels in sriracha butter or drizzle them with salted caramel, the crunchy snack is sure to help calm the nerves. For the Bacon and Cheddar Potato Skins recipe, click here. In the spirit of tossing around the ol’ pig skin, toss one of these potato skins into your mouth. 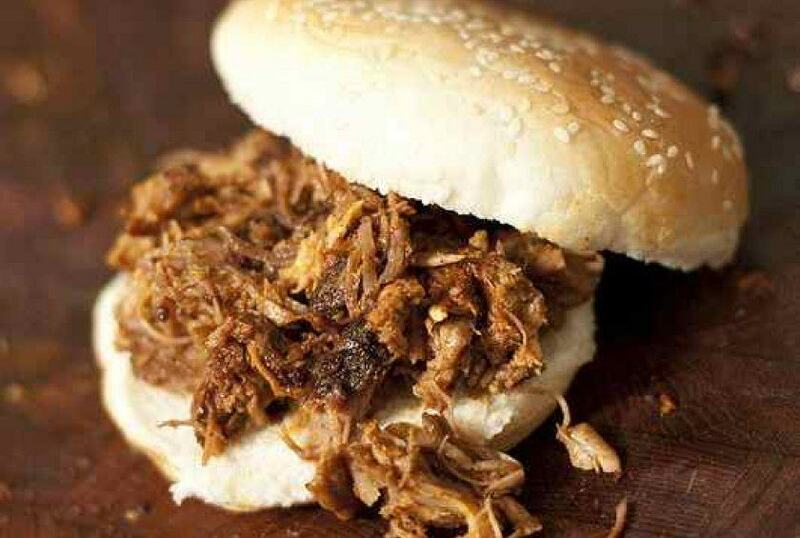 For the Slow-Cooker Pulled Pork recipe, click here. A pot of pulled pork is a superb addition to any Super Bowl party. It can be piled high onto nachos, slipped in between slider buns, or stirred into chili. Plus, with a slow-cooker you can set it and forget it while you make other game-day fare. For the Championship Glazed Ribs recipe, click here. It’s easier than you think to make ribs at home — just toss them on the grill or throw them in the oven and cook them at a low temperature to achieve fall-off-the-bone tender meat. A great accompaniment for nachos and enchiladas or simply paired with chips, salsa deserves a prime spot among the spread. Spice it up according to your own personal heat index and wow your party. For the Fresh Tomato Jalapeño Salsa, for click here. For the Barbeque Chicken Sliders recipe, click here. Don’t just call them small burgers; sliders are in a league of their own. These small, meaty bites were made for game day. Whether you call them heroes, hoagies, or subs, sandwiches are essential Super Bowl party foods. Sandwiches are particularly easy, too: You can make everything ahead of time and leave them out for guests to serve themselves as the game goes on. For the Italian Chicken Sausage and White Bean Sandwiches recipe, click here. For the Roasted Korean Chicken Wings recipe, click here. It literally isn’t game day without wings —the messier, the better. There is no need for non-meat eaters to miss out on game day.